You’ve been looking for a trip away in your RV for a few weeks now, you’ve spent hours planning and packing and now your vacation is only a couple of days away. The kids are excited and you’ve been itching to get away from work and unplug from the everyday grind. Before you go to bed, you quickly check over your RV campground reservation, only to notice that the campground only has 50 amp plugs, and you’re RV is a 30 amp. What are you going to do, are you going to have to change campground or sit out the entire trip without power? Can I Plug My 30 amp RV Into a 50 amp? The answer is yes, you can quite safely plug your 30 amp RV into a 50 amp socket, you’ll just need to use 30 amp to 50 amp Adaptor. These adapters feature a 120 volt 50 amp male plug and a 120 volt 30 amp female socket. 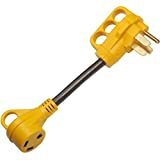 You need to take the 30 amp cord from your RV and plug it into the female socket on the adaptor, then plug the male end of the adaptor into RV campgrounds 50 amp socket. What’s the Difference Between a 30 amp and 50 amp Outlet? Which is Better 30 amp vs 50 amp RV? How Much Power Do I Need in my RV? Can I Plug a 50 amp RV into a 30 amp Outlet? A standard 30 amp plug will feature three prongs consisting of 120v hot wire, a neutral and ground wire. Typically 30 amps are found on RVs with lower power requirements. 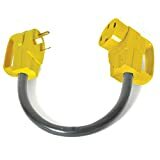 A standard 50 amp plug will feature four prongs consisting of two 120 volt hot wires, a neutral and ground wire. This design provides two separate 50 amp 120-volt feeds and is commonly used in RVs with high power requirements. This basically comes down to the watts available for use. We need to do a little bit of maths to calculate how much wattage will be available to us depending on the power outlet available, and we’ll use Volts and Amperes to do our calculation. In case you’ve forgotten your high school physics, Voltage can be considered a form of electrical pressure, and Amperes is a measure of the available current flow. The actual maths is straightforward enough. If we multiply the amps by the voltage, we’ll get the wattage. However, in a 50 amp shore power outlet, there are actually two 50 amp conductors available, so you’re getting 12,000 watts available to use. It should probably be called a 100 amp plug as that’s the actual amperage that’s actually available to you. As we now know how much wattage we have available to us, we need to understand much how is getting used by all of our electrical gadgets. If you check the back or underside of any modern appliance, you should find a sticker that tells you the wattage. It’s then just a question of adding everything up until you get the final figure, this number needs to be at the most 80% less than the rating for the shore outlet (if you’re planning to run everything at the same time). This is because circuit breakers are rated for 80% of the load capacity, if you continuously go over the 80% usage threshold then you have a good chance of tripping the circuit breaker. As you can see, using a hair dryer will use nearly half of the available wattage on a 30 amp RV. This is why larger RVs will predominately use a 50 amp feed, and only smaller RVs can use 30 amps. With a 50 amp outlet yo,u can probably run all of your electrics in tandem and still have plenty to spare. If you’re planning to park your RV at your home, then it’s worthwhile getting a professionally installed 30 amp pedestal fitted. This will allow you to run and test everything within your RV before taking a trip. If you just use your standard home plug with an adaptor, you’re only getting 20 amps, do you might not even be able to test the air con. As before, you’ll need to use an adapter to do this. There is a big drawback though, you’ll only ever get 3,600 watts to use in your RV. So, going from 12,000 watts down to 3,600 watts is a big hit. You’ll need to think carefully about what electrics you use. If your 50 amp RV has two air conditioners, then you may only be able to use one at a time. You may also struggle to use your air conditioning at the same time as you use other demanding appliances such as hair dryers or ovens. Drawing more power from the outlet that it can handle may result in the outlets circuit breakers triggering, which can be a bit embarresing as you may need to get the campgrounds staff to reset this for you. As always, if you have any questions or feedback on what you’ve read, then please let us know in the comments below.